Hey Folks! 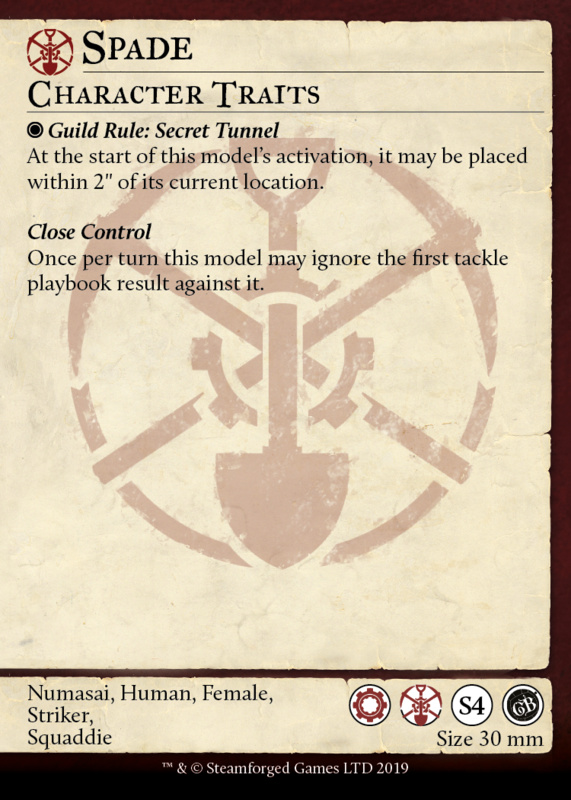 Before we get into today’s article we just wanted to quickly let you know that the Guild Ball Errata will be releasing on March 1st. All cards will be updated on the Resources Webpage, Guild Ball Manager App, and available via our Print on Demand Partners Drivethrucards on the day of release, and will be accompanied by an article from the Developers highlighting the changes. Last week we showed you the Expert Sapper of the Miner’s Guild, Fuse. If you missed that blog, catch it here! This week we’re going over THE BEST MODEL IN THE ENTIRE GUILD, IT’S DIGGER THE STEAMPUNK MOLE. Alright folks, let’s get real over here. First things first, look at his wee face and his goggles and his adorable lil steampunky claws. He’s already burrowed his way into our hearts, right enough. Ahem. Okay so Digger has a 1” melee, and his stats apart from that aren’t overly exceptional. He has a 3/4” KICK, meaning he’s actually very accurate at passing the ball around, and if he can get up there for a shot, he’s more than likely to hit it. His 4”/6” MOV is (like all Miners) deceptive, since he of course has Secret Tunnel, meaning he’s effectively roughly a 7”/9” model, with two separate moves, one of which is a place to help escape melee zones. So he’s fast and has a good (if short ranged) KICK, but apart from that, his stats are a touch on the low side. His playbook is actually pretty solid, however. He has a tickle of damage, and some momentous pushes further up, but really the only thing he’s reliably hitting is that Tackle. Which, combined with the strong elements of his statline, obviously push him further into the route of being a ball-oriented mascot. This is further highlighted by his character play, which is one we’ve seen earlier on Spade. Diggy Hole allows our little moley friend to place within 2”, meaning he can move a total of ~12” each turn, which gives him a not inconsiderable 16” goal threat. Not bad for a mascot, especially when so much of that movement is non-linear and can avoid melee zones entirely. Finally, 10 HP is about average for a Mascot with Digger’s defensive stats. Moments like this are why we play and make this game. And sure, Digger has Secret Tunnel and Close Control which let him tackle the ball and then keep it and Diggy Hole away and score goals for value…BUT the real story here is STOP, DROP, AND MOLE. In the best example of naming that this game, or indeed any game, has ever seen, this rule perfectly encapsulates our tiny friend digging a hole and kicking dirt all over his buddy in order to help them out if they’re on fire. Or poisoned or knocked down, or… you get the drill. [Editor’s Note: More puns like this please]. This is Digger’s secondary use. While he’s great at snuffling after the ball, either to retrieve it to pass it back to the friendly team, or to score goals himself, he can also clear conditions from your team completely for free. So let us know what you think about Digger on our social media platforms! 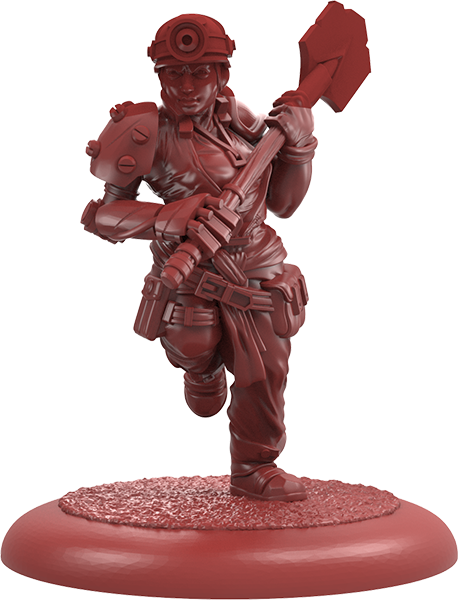 If you like the look of this cute little fella, pre-order your Miner’s Guild: Dig for Victory box here! Thanks for reading, we’ll be back next week with Shaft, the Foreman!